GolfBC Group, along with its parent company Burrard Group, announces that it is currently working with the real estate brokerage team of NAI Commercial to facilitate the sale of Arbutus Ridge Golf Club in Cobble Hill, BC. The property was acquired by the company in 1992. Bill Robinson, who is well known for his golf course work in Canada, designed the golf course. Construction commenced on March 17, 1987, and the first nine holes officially opened in 1988. Following construction of an additional nine holes in 1990, Arbutus Ridge Golf Club officially opened for eighteen-hole play in 1991, and is now a par 72, 6,152-yard semi private golf course owned and operated by GolfBC. As part of the company’s new strategic direction, the Burrard Group is focusing on the development of mixed-use residential communities and commercial projects located within 20 kilometers of major metropolitan centers and resorts, which includes increased investment in its select golf assets that meet those same geographic parameters. Included in its new strategic mandate is the growth of Burrard’s hospitality operations, which will capitalize on cross-marketing and F&B expansion opportunities within its already successful golf operations. The Arbutus Ridge facility has thrived for over 25 years and continues to provide outstanding value to residents of the community as well as golf enthusiasts both on the golf course and in the clubhouse. The establishment has taken great pride in its environmental sustainability efforts and has earned numerous accolades over the years, including the 2017 Tourism Vancouver Island Employer of the Year award. “While we are excited to pursue our company’s new strategic direction, it is with very mixed emotions that we have decided to market this fantastic asset which will certainly be a trophy property for the new owners for many years to come. The sale of Arbutus Ridge will provide funds for us to further enhance our other, more urban and resort-oriented golf properties and provide those markets with a more robust offering,” said Christian Chan, executive vice president of Burrard Group. “GolfBC’s vision to be the “first choice for golf” extends beyond the golf operations to include food and beverage, retail, instruction and event business, and a more strategic mix of golf assets will allow us to focus on our remaining facilities with a long-term commitment to the GolfBC portfolio,” added Andy Hedley, vice president of golf operations for GolfBC. Arbutus Ridge Golf Club is located in the seaside community of Cobble Hill, a 25-minute drive from the outskirts of Victoria and 15 minutes from the cultural city of Duncan. The golf course is rated Four Stars by Golf Digest, Best Destination Golf Course in British Columbia by Golf Nerve Magazine, One of Canada’s Ten Best Courses for Your Money by Westjet Magazine, has played host to numerous provincial and national championships, and achieved a Sustainability award from Tourism Vancouver Island. Open year-round, the golf course and clubhouse are specifically designed to offer some of the most stunning views on Vancouver Island amongst the characteristic Arbutus tree. The back nine climbs a ridge to overlook the Satellite Channel where you will find the Satellite Bar & Grille including wrap-around patio and ocean views. The Mount Baker room provides panoramic views and is one of the most desired Wedding, Meeting and Banquet facilities on Vancouver Island. The GBC Golf Academy showcases a full-length practice facility with five target greens and two short game areas. Arbutus Ridge is also complemented by three indoor tennis courts. More information on Arbutus Ridge Golf Club can be found on its website at www.golfbc.com/courses/arbutus_ridge. 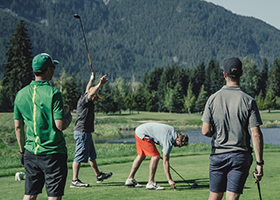 GolfBC, Western Canada's largest golf course owner and operator, and its parent company the Burrard Group have been creating premium golf destinations and master planned golf communities since 1989. GolfBC is the owner/operator of seven championship golf courses in British Columbia, including Nicklaus North (Whistler), Gallagher’s Canyon (and The Pinnacle, a 9-hole facility at Gallagher’s Canyon; Kelowna), Olympic View (Victoria), The Quail and The Bear (The Okanagan Golf Club; Kelowna), Mayfair Lakes (Richmond), and Arbutus Ridge (Cobble Hill). The group also owns and operates the Gold, Emerald and Blue courses at Wailea Golf Club on Maui, Hawaii. In June of 2017, GolfBC announced the addition of the Blue Ocean Golf Club to its management portfolio, which is under separate ownership. Additional information about GolfBC can be found at its website: www.golfbc.com.